At TEDGlobal this year, we’re meeting three ambassadors of Levi’s Shape What’s to Come campaign — three Indian women who are doing important work, and telling important stories, in their own communities. The TED Blog’s Corvida Raven sat down with them. Ladies, what do you do? Pavitra Chalam: I make films and tell stories about change, hope, and the future specifically for my country [India]. Karishma Shahani: I’m a fashion and textile designer. Shilo Shiv Suleman: I am a student, an artist, illustrator, and story-teller! I do all sorts of visual storytelling. 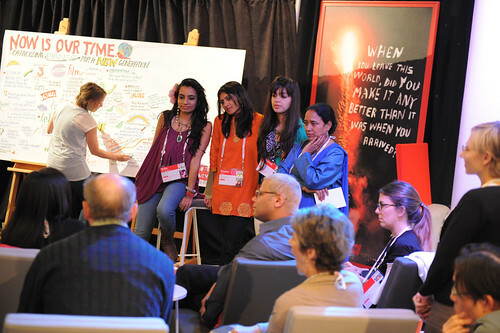 Patriva, which of your films would you introduce to the TED audience to give them a different perspective on the world? Pavitra Chalam: I would probably introduce my first film, which I made in Pakistan as a Peace Ambassador. This is before I knew much of anything about filmmaking. Somehow I ended up in the midst of what was one of the most controversial issues in the world. There were about 30-40 young people that wanted to say “this is enough”. We made a film called Bus and it was shot on a bus. Coincidentally, bus also means enough in Hindi. We wanted to talk peace. So, I decided that it would be good if the Hindu should played the Pakistani and the other way around. We took some interesting sort of gifts back home. I think we got a lot of perspective. This is important, not because of the quality or amazing story, but I think it transformed every single person who was part of the creation of the film. We made a statement about Peace. If we are going to lead our countries in the future, we started there. So, I would introduce that film to the TED audience. Karishma, how did you get into fashion and textile design? Karishma Shahani: I know it’s weird to say I knew I would do this. But you know what, I think I’ve always wanted to do it. I used to doodle as a child. I still can’t draw that well, but I tried! I wanted to be a lot of different things, I won’t deny that. But I became a fashion designer and I’m very enthused about it. I actually studied for my Economics degree before I went on to study fashion. I did not have a moment. I just wanted to do it. I love to make things. And Fashion is so close to you. It’s the first thing you see on the streets. Even when you have a timeline and it always revolve around clothes. That was the ’70s. That is the ’60s. So basically, I just think it’s so close to society, and so close to telling us what is happening in the world. Karishma, what is your most powerful piece that you’ve made to date? Karishma Shahani: I graduated last year and have started my own label now. So my first collection [Yatra] is my graduation collection. I would say the first piece that I made for that collection [is the most powerful piece]. I love them all. They’re all very dear to me, but that piece was fun. I like to have fun with my work. That piece was inspired by God and Lord Shiva, who I think is really beautiful. That was the first piece I started working on. Shilo, what do you get out of telling stories in such a visual way? What’s your favorite story that you’ve told and the materials you used? Shilo: My favorite story is what I’m working on now, which is called Khoya. Basically, I’ve been a technophobe all of my life. I always thought that if I got sucked in by an iPhone or an iPad. I might not see my dream or not talk to the flowers [laughs]. So basically, you thought you would miss out on life? Shilo: Yes! I decided I had to get over that because let’s face it, iPhones are cool! iPads are cool. I have one! So, I’ve been working on a series of interactive narratives for children using augmented reality and using the iPad to really bring alive the magic of a fascinating story for children. I love working with children and making storybooks for children. I did my first illustration book for children when I was 15. So I was still quite a child myself. [Shilo is 22 now]. How do you feel about being at TEDGlobal? Pavitra: It’s just amazing. I love it! There are no posts to display. New talks released daily. Be the first to know! Sign up for our daily or weekly emails to receive notifications whenever new talks are published.